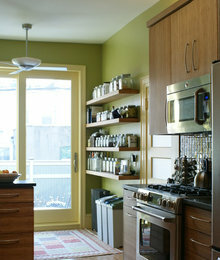 Open kitchen shelving can be wonderfully practical, but it can also be seriously messy. 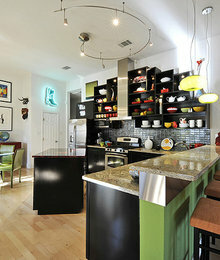 Can't the balance between a workable kitchen and a stylish one be hard to strike? While open shelving and countertop canisters for utensils have often been features of a more casual, rural kitchen, these elements now find themselves in sleek and modern kitchens as well. In fact, kitchens of all styles are more and more successfully exhibiting the lived-in feel of a workable space — a room that is the warm heart of the home, no matter if said dwelling is urban and sophisticated or more traditional in appearance. Here are eight ideas to work open shelving into your home, for chic results that work with any style. 8. Make your materials monochromatic. This kitchen manages to have a modern and classic feel. The dishes coincide exactly with this aesthetic. Open and casually stacked, the dishes offer a clean and uniform look. 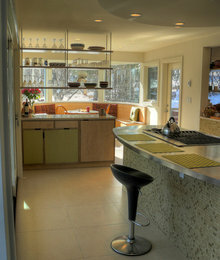 This kitchen is unbelievably minimalist, yet offers plentiful open storage around the corner of the island. 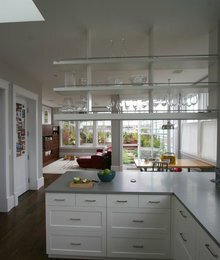 The shelves seem to float on air along with the clear and beautiful island stools. 7. Keep them on the side. If open shelving right in your face is too much, consider creating more distinct open shelving just on the side of the kitchen. 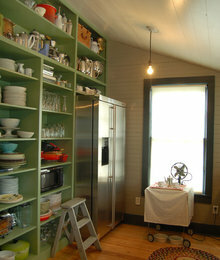 Floor-to-ceiling shelving can easily be added to a nearby pantry or even a close hallway wall. 6. Segment the storage. This wonderful working kitchen offers accessibility without clutter, thanks largely to segmenting the materials. Pots, pans and heavier items go below on the island, lighter servingware resides on the upper shelving, and grab-able spatulas and utensils find a discreet spot in the corner of the countertop. 5. Think clearly. 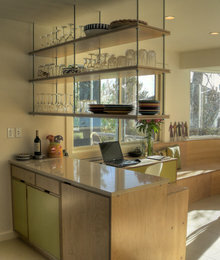 This hanging shelving keeps the room open when clear glassware and serving platters are stored. Keep the heavy plates, pots and pans for another area. See how wonderfully it keeps the room open? 4. Consider hanging shelving. Most of us think of open shelving as being against a wall, but this shelving system adds storage in a normally blank space. 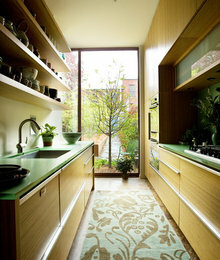 Adding this kind of shelving automatically gives you much more kitchen storage space without obstructing the view. 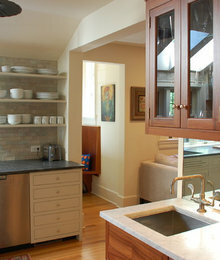 One slender shelf resides above the cooking surface and coincides with the larger storage on the island. 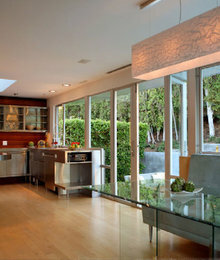 The kitchen therefore manages to look sleek while offering workability. This metal shelving also seems to float vertically above the cooking area, and ties beautifully into the metal throughout the room. 3. Build a display. 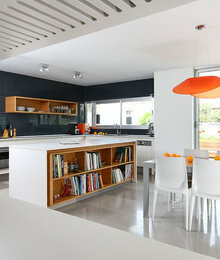 In modular kitchens, use the space's vertical versatility to add storage as well as beauty. This shelving keeps items organized and separated while creating an overall look that flows well with the other dark wood and the similarly stacked art. 2. Single out the spices. 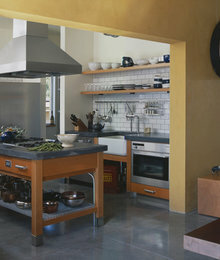 While larger pots and pans are kept hidden, the smaller ingredients like spices are lined up on small, slender shelves. Such a deliberate arrangement not only keeps the buildup of spice jars out of your way, it becomes a beautiful display. 1. Use uniformity. Rather than a random mix of materials, line up bulk ingredients in glass jars. You'll be better on the earth and better on the eye. 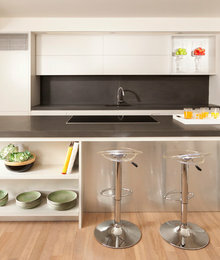 This wall is so sleek and keeps what the cook needs within an easy arm's reach.